Did I really just burn thru a three day weekend that quickly? Ugh. I woke up at dark-thirty with my back ... screaming is the word that comes to mind but I know that won't make sense unless you have ever had back pain. Screaming back pain, that is. I work from 9-2 the first three days this week and then 11:30-4:30 on Thursday. I would kinda sorta like to work the earlier schedule on Thursday too, so that if I decide to go to the mountains this weekend (and I'm kinda sorta thinking I might) I could go up on Thursday before rush hour and would have more time up there. But I also kinda sorta feel like maybe I shouldn't. There is some physical work involved in being there by myself... carrying my own stuff in, the trips up and down the stairs to my basement nest... taking the trash and so on... and I feel it in my spine today, believe me. Anyways... gas is $3.69 a gallon and I have to think about the cost involved in going up there. Although I could do it cheaper than I did this past weekend because I definitely splurged on some favorite foods when I could have easily just done a crock pot full of beans and made some cornbread. But anyways... haven't decided yet. I keep hoping that Austin will want/need my help, even though that in itself is costly. I want to be around and able to help when he needs me. If he needs me. 1. I did my laundry last night. Organized, folded, hung up. Ready to pick out something cute to wear once I figure out the weather. 2. I made this great batch of taboule this weekend and brought a bunch of it home. Breakfast of champions! 3. It's five hours. I mean. it's not like I'm pulling a twelve hour shift in the coal mines or anything. I love my job, I love my schedule, I love what I do and the people I work with. 4. 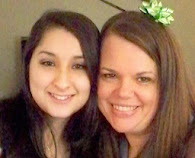 My friend Whitney from Jacksonville found out last week that she's having a baby girl! I'm so stinkin' excited for them that I can barely stand it. A little girl with Whitney's personality and her honey's - also amazing - personality - is going to be just a treasure. The only things I miss about Jacksonville are the library, the beach and Whitney. And maybe a few restaurants. 5. Temperatures in the mid-seventies for a high today... I might try wearing tights. I love tights. I can't wait until it's cool enough for me to wear my cute boots. It's Fall, y'all! 6. Twice this weekend TWICE, I tell you! I had someone compliment how I look which... seriously... I'm super fat, fatter than I was when I started Weight Watchers the last time... and it semi-sorta bothers me when I catch my profile in the mirror and it sorta bothers me when I can't fit into stuff I want to wear but... being told that I look good even though I'm fat makes me feel like a runway model. 7. Today is my Uncle Carl's birthday. We have a big cluster of birthdays in our family - Daddy on the 21st, Carl on the 24th, my mama and my cousin Dixie on the 26th. My nephews Joshua and Matthew also have birthdays this month. 8. I spent yesterday afternoon reading about Scottish history. There's a twig of the family tree that (I believe, if I'm correct, usual disclaimer) led back to Robert the Bruce, a Scottish King who... ironically was responsible for the death of John Comyn, who is another ancestor, I believe. 9. Work. Picking up Marquee. Back in the nest by 3pm, if I'm lucky. We'll beat this Monday thing. We can do it. 10. My dad's cousin Leslie was born the same week he was... and the two of them were raised like twins, living at Great-grandma Ward's house when they were itty bitties. Leslie died tragically five years ago and this past weekend, her sweet daughter, Rachel, got married. 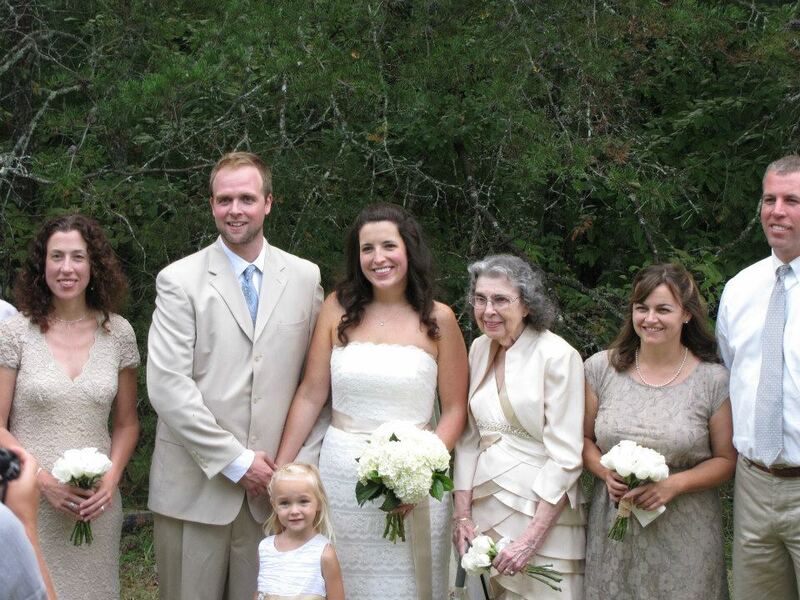 I snagged this picture of the wedding party -Rachel's Gram - (also my Grandma's sister and sweet Steel Magnolia), Great Aunt Bette is 3rd from the right. So lovely! I love her dress. And Rachel's too! Have a great Monday, y'all! This is really interesting to read! Hope you will post many more! Thankful For YABBA DABBA DO! Step One: It's ok to be you.